South Palm Beach County, Broward County, North Dade County, Florida students who will participate in Dr. Larman’s S.R.M. program (including the gifted students) will improve significantly in their reading and language and their scores will go up, we guarantee it. The success of Dr. Larman’s Scientific Reading Method has been demonstrated to be effective by the thousands of students that have gone through the program. Most importantly, Dr. Larman’s methods of instruction are based on scientific research! 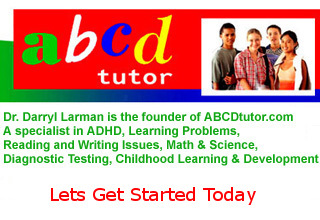 Instructors at The Broward and Palm Beach County ABCD Tutor are certified by Dr. Larman to be effective S.R.M. teachers. Dr. Larman’s S.R.M. boosts children’s language and literacy skills and builds their confidence and self-esteem! Our goal is to help improve the educational futures of all children across America. Dr. Larman’s Scientific Reading Method (S.R.M.) is based on scientific research and the scientific method. What this means is that all instructors at ABCD Tutor uses methods and materials that have been proven to be successful. The methods we use raise children’s reading levels and reading scores and builds children’s confidence and self-esteem. Scientific reinforcement techniques are used in every lesson. Instructors follow a special Prescription for Learning that is written by a certified ABDC Tutor Director. The directors have been certified by Dr. Larman to write a Prescription for Learning. The Prescription for Learning has the instructional reading grade level of the student and lists the methods and materials to be used with each student in a one-teacher one-student instructional setting. Dr. Larman’s Scientific Reading Method (S.R.M.) is the culmination of over four decades of hands on teaching in the classrooms of America. Dr. Larman’s research, which can be found in the Library of Congress in Washington D.C., proves that his methods of instruction raise children’s levels and scores on standardized tests. Dr. Larman's has proven, using the scientific method, that his methods not only raise children's standardized test scores, but his methods raise children's I.Q. scores!